Ever wonder why you spend so much time gathering ingredients for your next meal in The Legend of Zelda: Breath of the Wild , or grabbing all the miscellaneous junk you find lying around the Talos 1 in Prey ? It's the ingenious way they handle crafting. These systems are more than just a means to an end - they're constantly generating more reasons to keep playing, even though we often take them for granted. When done right, crafting doesn't just supplement other aspects of a game - it can completely change the way you play. At the most basic level, in-game crafting (and by extension, cooking) is as simple as gathering materials that have little to no use on their own, then recombining them into a more enticing reward. Such a seemingly straightforward pursuit can weave through exploration and combat alike, tying an entire world together and creating motivation outside of the main plot. Providing players with the tools they need to collect and assemble objects in intriguing, motivating ways is an art form - and some techniques work far better than others. The core principles of satisfying crafting aren't obvious, but they're necessary to making this pervasive activity into a worthwhile endeavor instead of a tedious chore. Here are the rules all crafting metagames should adhere to, so that worthless junk can be elevated to worthwhile content. Part of crafting's appeal is the sense that you're using up a finite resource. Otherwise, without some limitations to the quality and quantity of what you can create, crafting would obliterate game balance and ultimately feel like a cheat code. But it's equally unfulfilling to feel like your crafting materials are just useless junk taking up inventory space, without any way for you to put them towards something advantageous. That's when destruction becomes a means to creation: breaking down unwanted items for materials that make up those things that do appeal to you. Consolidating your inventory in this way needs to be a tangible benefit, rather than a drop in the bucket of a needlessly stingy system. Prey takes all that seemingly useless junk you've been compulsively collecting around the Talos 1 - pouches of medical waste, petri dish samples, discarded banana peels - and lets you convert superfluous garbage into potentially life-saving greatness with the handy Recycler machine (which also gets points for spitting out delightful, gumball-like orbs to represent the essence of deconstructed items). Diablo 3: Reaper of Souls and Nioh let you break down just about any item into reagents for tweaking variables on your best gear, rather than forcing you to joylessly remake it all from scratch if you don't love the final product. For an example of what not to do, look at games like Team Fortress 2 and Hearthstone, which taint the concept of flexible resources by siphoning out massive amounts of value from your items whenever you break them down. Grinding your items down to dust ought to feel like a step in the right direction, rather than a painful loss. The chance to earn extra crafting materials can make the best parts of a game more enticing. in The Legend of Zelda: Breath of the Wild, snagging an elusive ingredient for your next cooking recipe could involve scrambling up a mountain or sneaking past a large pack of Bokoblins, reinforcing the skills you'll need to succeed throughout your entire adventure. And the cheery, suitably brief jingle-jangle that accompanies the actual act of cooking is sure to go down in the Zelda pantheon of catchy little melodies that feel like rewards in and of themselves. Fallout 4 is centered on exploration and combat, and its crafting system reinforces both. All the various knick-knacks littering the landscape are an incentive for you to explore a bit farther (and more thoroughly) than you might otherwise, and you're encouraged to engage in shootouts if only to collect the arms and armor of defeated enemies. 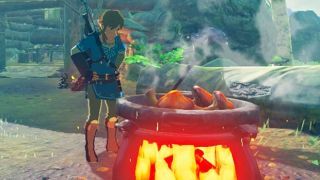 What are the best recipes in Zelda: Breath of the Wild? Several role-playing games follow a similar style. The grind in a JRPG doesn't feel so tedious when you're being showered with craftable trinkets after every fight. The endless countrysides of Witcher and Dragon Age: Inquisition don't feel quite so empty when you're constantly rolling up on herbs and flowers to pick. And when the things you're crafting allow you to explore new areas, challenge stronger enemies, and receive even greater materials, the whole cycle creates a satisfying feedback loop that can keep you invested in a game for a long time. The time it takes to craft items - whether in-game time or real-time - can split the difference between fun and migraine-inducing rage. Crafting is typically instantaneous: you gather some herbs, push a button, and out pops a shiny new potion. But consider Tactics Ogre: Let Us Cling Together, an excellent game save for its tedious crafting. All items, from finished weapons to individual ingredients, must be made one at a time. High-level ingredients therefore need a ton of prep-time, and the poorly designed menus prevent you from finishing this busywork swiftly. Ultimately, this means items that should take seconds can eat up a fifteen minutes or more of your playtime. Another easy way to confuse players - and in turn, prolong the time it takes for them to accomplish their crafting goals - is to obfuscate the creation process with needless extra steps. Mass Effect: Andromeda is a recent - and major - offender in this regard. You first need to scan objects in its universe to unlock Research plans from three separate trees, then gather materials needed for Development to actually get any of that new loot into your inventory. As if that weren't convoluted enough, the cluttered interface in the crafting menu - along with all the potential variables you can tweak (many of which can render the crafted weapon worthless) - turn the entire process of R&D into a massive headache that most players will gladly skip so they can pursue something of genuine interest rather than a tedious timesink. But when handled correctly, a delay in your crafting order can add excitement and anticipation to the process. Look at XCOM: Enemy Unknown. The most powerful items you can make - from drones to power armor - take days or weeks of in-game time to fabricate. Because XCOM is a tough game, chances are you'll suffer some setbacks during that time - such as your entire squad being killed by horrible aliens. The promise of new, better equipment is the carrot-on-a-stick you'll need to press on through those dark times towards greater victories. And because the risk and reward of these lengthy craft times is made clear, you always have a definitive understanding of what you're getting into with each new item. It's ok for crafting to be a multi-step process, and that little extra wait can sweeten the final payoff, but players should never feel like their time is being wasted or disrespected. Crafting recipes can go one of two ways: either they're explicitly spelled out, as in Prey and Fallout 4, or you're afforded some freedom to discover how to make things on your own. Both approaches have merit, but the latter has the potential to blossom into someone's primary motivation for playing a game. That's part of what makes Minecraft and Don't Starve so enduring: the ingeniously simple, intuitive crafting grid is fuel for the imagination, letting you experiment to your heart's content in the pursuit of logically laid-out recipes. Sure, you can just look it all up online if you want to take the direct approach - but having that creative space to mess around in enriches the experience that much more. Or take the Atelier games, the JRPG series that revolves around alchemical crafting. Synthesizing items relies on fixed recipes, but there are dozens of variables to manipulate, including elemental infusions, and the order you mix the ingredients. When you finally stumble upon the ultimate method, it's like discovering the formula to curing cancer. Ok, maybe it's not that exhilarating, but you get the idea. When the question of what to do with all your crafting materials is consistently obvious, boredom is the inevitable result. If one item is clearly a better choice over all the others, those inferior options may as well not exist, turning the act of crafting into a mundane routine of mindlessly converting X into Y. Rather, your choice to craft should be the pursuit of a preferred specialty, or an expenditure of resources for one benefit that deprives you of another, equally viable opportunity. The former is exemplified in MMOs like World of Warcraft and EVE Online, where no one player can hope to build everything they could ever want on their own. Your choice of crafting mastery becomes part of your reputation, distinguishing you from those who chose other paths with their own unique rewards. And in games like The Last of Us, your crafting resources all go towards items that could easily save your life, depending on the situation. You're constantly having to weigh the advantages and try to predict what you'll want most, like whether that Alcohol and Rag combo should provide the offense of a molotov cocktail or the defense of a restorative health kit. There's no one 'right' answer, and that's what makes it interesting. When all's said and done, the fruits of your labor should change how you play the game. Without this sort of meaningful reward, the entire crafting process is rendered pointless. Persona is a great example of an entire franchise built on item crafting - only the "items" are spirits and demons. Everything you do in these games results in molding your Persona into a better weapon, whether by combining it with other Personas or utilizing skill cards to alter their abilities. Through careful refinement, you can fabricate the perfect pseudo-religious entity for your lineup. Final Fantasy X is a more conventional example of crafting meaningful rewards. Here you're not forging new weapons, but modifying existing ones with new abilities. Being able to infuse "Piercing" or "Zombietouch" into a sword can open up different tactics and strategies for you in battle, which in turn encourages you to explore the game's mechanics further. Games whose crafting only provides marginal improvements over base materials - "arrow" vs "arrow +1" - are missing a valuable opportunity to let you flex your strategic muscles and develop your own strategies. Randomness is rarely handled well when it comes to crafting. The first Witcher game takes an interesting approach to randomness in its potion-making system. At first, brewing potions is a complex and seemingly unpredictable process. You can make multiple vials of the same potion, only to discover that each one has a slightly different effect. Gradually, as you learn more about the ins-and-outs of the Witcher universe, you deduce that these discrepancies are due to which ingredients you use (among other things). Knowing this, you can mitigate this randomness to get exactly the type of potion you want, or lean into the uncertainty to discover new recipes. Sadly, The Witcher is a rare exception here. I hate to dump on this game so much, but Tactics Ogre: Let Us Cling Together once again demonstrates what NOT to do in your crafting system. Here, randomness is handled in the most ham-fisted way possible: everything you craft has a chance to fail. This means all the time and resources you poured into crafting this item so far are simply wasted. What's even better is that you can negate this risk by saving the game before each crafting attempt, and reloading if it fails, thus further exacerbating the process to comedic proportions. At least, it might be funny if it wasn't so infuriating.